It is forecast to take years before new construction keeps pace with demand. THE CHRONIC LACK of housing across Ireland is the country’s “most pressing issue” and it will be many years before new building puts a dent in the unmet demand for homes. Investec economist Philip O’Sullivan, commenting on the firm’s latest economic monitor, said that strong increases in house prices and rents would continue as tens of thousands more houses needed to be completed annually to serve the existing market alone. While the financial company predicted that 21,500 homes would be completed this year and 24,000 would be build in 2019, both figures were well below the 30,000 to 50,000 new households estimated as being formed each year. “The key message here remains that it will be a number of years before output can meet the flow of new demand, much less put a dent into the growing stock of unmet housing need,” O’Sullivan said. 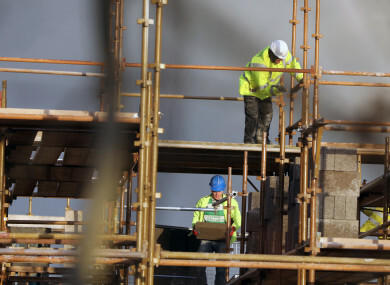 The Society of Chartered Surveys Ireland previously predicted the housing crisis could last another decade as part of a pitch for the building sector’s VAT rate to be temporarily cut to zero. Meanwhile, the Real Estate Alliance’s average house price index said the price of a three-bed semi-detached home had risen to €229,000 nationwide, up more than 9% on the figure from a year ago. In Dublin city, the average price of the family homes had hit €440,000 after increasing nearly 9% in the past 12 months. Investec predicted house prices would grow another 8% this year, although the risks to that forecast were “to the upside”. The situation would be similar in the rental market, although rent caps in urban centres should slow the trend. A recent Economist cost-of-living survey found that Dublin was now significantly pricier than London, while employers have complained that rising housing costs were making it increasingly difficult to attract and retain staff. Nevertheless, O’Sullivan said that the labour market continued to be “a key source of good news for Ireland” and in general the “sun is shining” on the country, with the first general government surplus since 2007 expected to be delivered this year. A tightening jobs market should continue to lift wages, which increased 2.5% in the last quarter of 2017 when compared to the same period a year earlier. That would also help the retail sector, which continued to deliver strong growth figures with the exception of the sterling-hit cars market. Email “Ireland's chronic housing shortage is the economy's 'most pressing issue'”. Feedback on “Ireland's chronic housing shortage is the economy's 'most pressing issue'”.